On average, many Americans spend more time at the office than they do at home. Studies show, that a positive and healthy environment keeps your employees happy and productive. In most office spaces, employees often work in close quarters, between the break room and general living habits, there are many things that can cause allergy sufferers to have an attack. From mild irritations to asthma attacks, allergic reactions are not something you want to have happened in your office. Following some of these simple tips will keep your office an allergy free zone, which all your employees will appreciate. Crumbs, spills and dirty dishes are not only unsightly but they also contribute to mold. Keep the break room tidy at all times. Assign a weekly monitor from your staff to help share the responsibilities and keep employees accountable. Couches and carpets trap dirt. Only regular vacuuming will help keeps dust, dirt, and pollens from getting embedded in soft fabrics. A monthly or weekly deep clean might be necessary depending on the traffic and use they get. The perfect place for dust mites to hide as well as bacteria from fingers and even pollen from the outdoors. Keyboard covers help as well as keyboard dusters and cleaners. Encourage employees to keep their stations clean or hire a professional service that will make sure keyboards are dust free. A simple request to reduce irritations brought on by many fragrances is to ask employees to abstain from wearing colognes or perfumes and keeping any other body creams to neutral fragrances. Air purifiers or air filtration systems will help catch all the outdoor pollen and microscopic dust that even a cleaning service can’t get to. It will also help with pet dander. If there are employees that suffer from pet dander, separate their workspace from those that have pets, as pet dander will most likely be on their clothing. Having lint rollers available in employee washrooms as help to reduce allergens brought in on clothing. Keeping your office allergen free takes work. Employees may be tidy but can’t be relied on to ensure that your office is deep cleaned. Having a reliable cleaning service is a good investment for every office and the best way to keep allergens at bay. Keeping a clean work environment is important for all business owners. Employees expect that they will be able to work in a safe space without the distraction or irritation of allergies. To book a consultation for a cleaning service quote; click here and contact BearCom today. 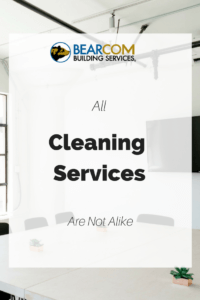 When looking for a cleaning service for your commercial building, there are some aspects to consider before choosing which janitorial company you will hire. 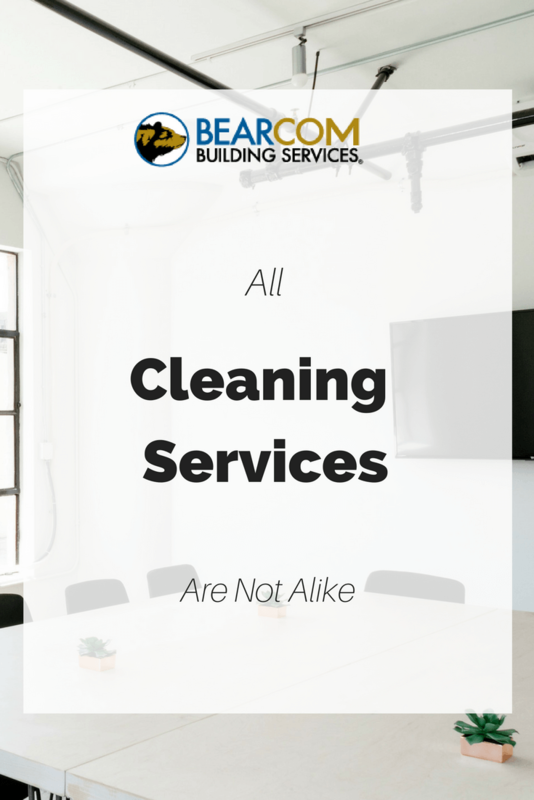 It is important to note that each janitorial company has different specializations and you should take the time to decide which one is right for you are your business. Cleaning service companies can range from basic to having extensive additional services. Most cleaning services will cover the basics such as sanitizing restrooms and vacuuming and washing the floors. Others can provide additional services such as carpet cleaning, window washing, buffing the floor and more. The best services are flexible and willing to perform the job you need doing. Look for cleaning services that specialize or have extensive in your type of building. Some cleaning services focus mostly on schools or small commercial while others on exclusive large office buildings. It helps to have a service that will understand your exact needs and experience is the best way to show that. Look for your type of business is listed on their website. The terms of the services provided will vary with each company. Some renew monthly and some for 1 year or longer. Decide what sort of setup works best for your business and know that that there are different options. The best cleaning service companies will stand by their services with a guarantee. Having a guarantee that ensures that you will receive the service you are paying for, gives you peace of mind and helps build a trusting relationship. Not all commercial companies provide one, look for a guarantee and details on how they honor it through their website. Speed it something to look for as well. If there was an issue to arise, you would want it resolved within one business day. Since many cleaning services are provided off work hours so as not to bother staff, having some sort of transparent inspection system helps communicate what services have been completed. From checklists available to more sophisticated programs, these services can vary dramatically. The best cleaning services will have programs such as CleanTelligent that will allow you to view your services through a portal. Janitorial services must be flexible and cater to the needs of your business. If you have long or unusual business hours, you need a service that is willing to work around your schedule. Additionally, many services provide green cleaning options such as recycling programs, so you can enjoy not just a clean office, but an environmentally safe office as well. If you are looking for commercial cleaning services, BearCom Cleaning services can provide a quote to see if they are a good fit for you. Learn more about our services here.